‘Natural gas is a suspect, but right now we can’t rule out anything,’ says Gordon Wren, head of Rockland County Fire and Emergency Services. Seven people were injured Tuesday morning in a campus explosion at Nyack College, north of New York City. Windows were blown out of one of the college’s academic buildings during a “violent explosion” that occurred at approximately 9:35 a.m., according to a fire official. There were seven people inside the building at the time, some of them students meeting with professors on the second floor, said Gordon Wren, head of Rockland County Fire and Emergency Services. All are being treated for injuries, but none appear to be life-threatening. “One of them was blown or fell from the second story through a window and is being treated for back and neck injuries, but as far as we know none of them were seriously hurt,” Wren told the Daily News. A fire alarm inside the college building triggered the first 911 response, he said, followed almost immediately by a radio call from a Nyack College security guard. Several fire departments responded to the scene, said Wren. Investigators are combing through the rubble of the interior of the building to find a cause. The massive explosion ripped through one of the staircases leading to the second floor, according to investigators. Officials believe they have accounted for everybody who was in the building at the time, Wren said. A downtown Des Moines street is blocked off after two explosions were reported early Wednesday morning. Firefighters said they had several local residents living near 4th Street and Court Avenue call just before 2:45 a.m. reporting an explosion. Officials said the first explosion was near The Elliot Apartment Building on 4th Street. One local resident told KCCI 8 News in Des Moines he was one of two witnesses of that first explosion. He said he smelled gas, saw smoke coming up from a manhole and then saw a massive explosion. He said he saw flames shoot up at least 30 feet in the air. Police said a second explosion happened within about 10 minutes, less than a quarter mile from the first. Officers said it's a gas or electrical problem under the ground, but they're still working to determine exactly what caused the explosions. 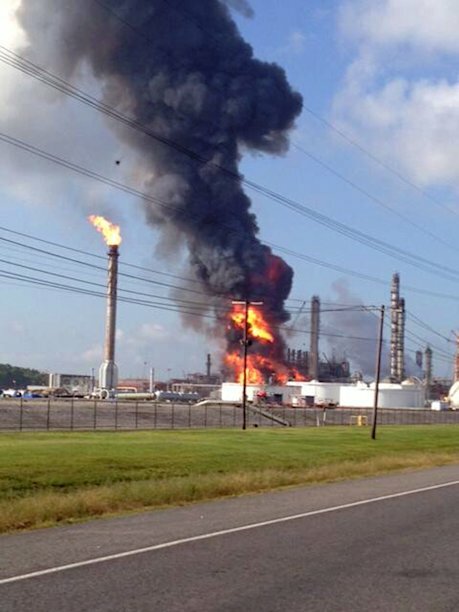 "This photo provided by Ryan Meador shows an explosion at The Williams Companies Inc. plant in the Ascension Parish town of Geismar La., Thursday, June 13, 2013. The fire broke out Thursday morning at ...the plant, which the company's website says puts out about 1.3 billion pounds of ethylene and 90 million pounds of polymer grade propylene a year. (AP Photo/Ryan Meador)"
Powerful Explosion at Louisiana Chemical Plant Injures 73 and Kills one 1 Person! LIVE Press Conference Update with Louisiana Governor Bobby Jindal June 13, 2013 Williams Geismar Plant Ascension Parish Louisiana Department of Environmental Quality 1.3 billion pounds of ethylene and 90 million pounds of polymer-grade propylene each year produced at this plant"
"People are still unaccounted for after a house exploded in Westminster Thursday. According to officials, four homes were involved, with two heavily damaged. Sister station KCNC says one home was blown apart. A gas explosion is suspected but not confirmed. Two people reportedly suffered minor injuries. Officials say they self-evacuated after they smelled gas. The explosion happened near 92nd and Ingalls. We are working to get more information." "DONALDSONVILLE - Sheriff Jeff Wiley confirmed one person is dead after the second explosion in as many days at a chemical plant in Ascension Parish. He said someone was offloading product from an 18-wheeler at the CF Industries Plant in Donaldsonville when it ignited this evening before 7 p.m.
State Police reported five people were injured in the blast, while Acadian Ambulance said they've transported seven people to local hospitals." ok this is second explosion like this in as many days.. anyone find that strange?? Geismar is 20 miles from Bayou Corne and Donaldsonville is 14 miles from Bayou Corne, Geismar is E of Mississippi River and Donaldsonville is W. of Mississippi River each of them about one mile from the River itself. "A massive explosion has rocked Manhattan, few blocks away from the UN headquarters. Police and firefighters are at the scene. Initial reports suggest that an underground transformer exploded setting nearby cars on fire. The incident occurred at the intersection of 50th street and 2nd Avenue. There have been no immediate reports of casualties. " A transformer fire in Midtown has both police and firefighters at the scene. Fox 5 has learned it is a Con Edison manhole. Witnesses say the nearby building shook and a car caught on fire. Say doesn't Brooklyn have these types of problems with their manholes too??? "An explosion shook a technical school in Manhattan today, injuring several people, the New York City fire department said. 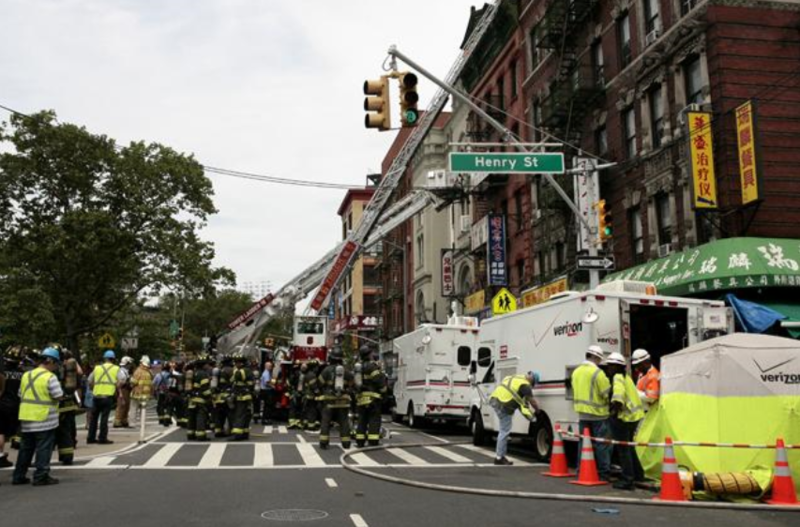 The New York Fire department said that the explosion, which was first reported at 11:29 a.m. (16:29 GMT), took place at the second floor of the Apex Technical School on 121 West 19th Street in Manhattan. There was no official number of injuries, but the fire department unofficially counted six people going to hospitals. Unofficially fire department people on the scene said the explosion may have been caused by a gas leak." Thanks Reddwolf I guess we could say that Manhattan has had an explosive day. A gas pipeline rupture sparked a large explosion in Washington Parish, Louisiana, potentially causing damage to surrounding structures. The ensuing fire has reportedly been put out. Thanks for that, Redd. Do you know if that explosion was close to Bayou Corne? This explosion was in a town called Franklinton in Washington Parrish. Its about 80 miles from Bayou Corne Kande. Thanks Redd! Things certainly don't look good for that area. I am going to post this video I found on this thread too. I wonder how many of these explosions we don't even hear about? I bet there are a lot more of those explosions due to "the heat." This guy did a good job with that video. His explosion was in 2010. It makes you wonder how long this has been building up. It does seem like it is starting to come to a head now. (Reuters) - A major natural gas pipeline exploded on Tuesday in Washington Parish, Louisiana, destroying a mobile home and causing an evacuation of the area but no injuries were reported, local officials said. The blast on the Florida Gas Transmission (FGT) pipeline, which transports gas from Texas to south Florida, sent a mushroom cloud into the sky and sparked a fire on the line, according to Lauren Ritchie, a spokeswoman for the Washington Parish sheriff's department. There were no injuries and the damage is being assessed," Ritchie said, adding that the fire had been contained. State and federal officials were taking air quality readings and investigating the incident, which occurred in a rural area near the town of Enon, 80 miles north of New Orleans. Ritchie said 55 residents were evacuated." It appears the siding of a mobile home melted off in the gas line explosion in Washington Parish! There are no reported injuries in the incident. Large explosions rock an ammunition depot in Russia’s Samara Region, where over 13 million shells are stored. The police have started evacuation of the nearby communities. 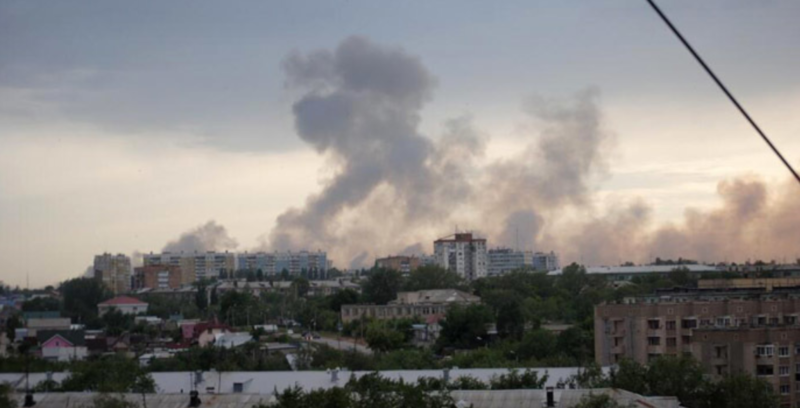 Multiple artillery shells keep exploding at an ammunition depot near the city of Chapaevsk, a local police spokesman told RIA. Are Exploding Manhole Covers In Washington DC Caused By Shocking Levels Of Leaking Natural Gas? "Residents of Washington, DC are used to jokes about metaphorical hot air, humidity, and the swampy history of their city. But there’s something they may not know about the District: it’s overrun with methane, which sometimes makes manhole covers explode. Natural gas is mostly methane, and it is carried through underground pipes to heat buildings and cook food. Those pipes are often old, and this led ecologist and chemical engineer Robert Jackson of Duke University to drive around DC over a period of two months, regularly measuring the air to take methane levels." He and his research team found methane leaks everywhere, with thousands of places having significantly higher than normal methane concentrations, and some places reaching 50 times normal urban levels (100 ppm vs 2 ppm). A similar study in Boston last year found essentially the same results. In DC, the source wasn’t the swamp on which the city was built — it was fossil fuel. (The methane they measured had more carbon-13 rather than the normal, modern carbon-12." Methane leaks mapped as 3,356 spikes along 785 miles of road in Boston. Yellow indicates methane levels above 2.5 parts per million. The Environmental Defense Fund is in the middle of a two-year effort to analyze methane leakage during the natural gas life cycle — from extraction to consumption. They have already commenced with studies at wellheads and on natural gas vehicles, while an examination of local distribution of natural gas is forthcoming. "An explosion at a grain silo in northwest Indiana has killed one person. The explosion happened at the Union Mills Co-Op just south of LaPorte. At 1:29 pm the LaPorte County Dispatch Center received multiple 911 calls reporting an explosion at 3551 West 800 South in Union Mills. Upon arrival officials assessed the scene and confirmed that one person had been killed, but no other injuries have been reported." "YARMOUTH, Maine — Emergency personnel went to the scene of a large explosion at two homes on Gables Drive, off North Road, in which one man died and three others were injured. Several agencies sent mutual aid to the scene, including the Portland, Topsham, Freeport and Brunswick fire departments, people at the scene reported. Investigators from the state fire marshal’s office and members of the state’s Solid Fuel Board continue to work on the cause of the explosion, which leveled a two-unit building in Yarmouth owned by Walter Corey. The man who died in the explosion is believed to be Peter Corey, 66, according to Stephen McCausland, spokesman for the Maine Department of Public Safety." "ST. LOUIS — A fire and explosion that apparently started in an underground electrical transformer sent fireballs and thick black smoke shooting from a street outside one of the largest office buildings in downtown St. Louis late Tuesday afternoon. No injuries were reported. Several hundred people were evacuated from the 36-story One US Bank Plaza building after explosions occurred in the street outside just before 5 p.m. The building is across from the St. Louis Convention Center, and construction work has been underway in the area for a couple of months. The cause was not immediately known, but Fire Capt. Daniel Sutter said it originated in an underground vault that houses an electrical transformer. Sutter said the initial suspicion was that the transformer caught fire." Posted: Sunday, July 7, 2013 --- 8:21 p.m.
Rock County dispatch confirms that there was a home explosion in Beloit. "The seas, lakes and oceans are now pluming deadly hydrogen sulfide and suffocating methane. Hydrogen sulfide is a highly toxic water-soluble heavier-than-air gas and will accumulate in low-lying areas. Methane is slightly more buoyant than normal air and so will be all around, but will tend to contaminate our atmosphere from the top down. These gases are sickening and killing oxygen-using life all around the world, including human life, as our atmosphere is increasingly poisoned. Because both gases are highly flammable and because our entire civilization is built around fire and flammable fuels, this is leading to more fires and explosions. This is an extinction level event and will likely decimate both the biosphere and human population and it is debatable whether humankind can survive this event." A blaze that ripped through a problem-plagued Chinatown building in New York on Thursday — injuring a dozen people, two critically — was apparently sparked by roach bombs being “improperly used,” a police source said. The 12:45 p.m. explosion occurred at the rear of a first-floor hair salon at 17 Pike St., where fire investigators found boxes of Raid fumigating foggers and Decon bug bombs, a police source told the Daily News. Three people have been injured in a natural gas explosion in Corpus Christi, Texas on Friday, July 12. "Fire Capt. James Brown tells Caller that three homes have incurred damages and the blast was felt blocks away, taking 34 people out of their homes. Initial reports show that a gas buildup in a home at 4800 block of Holmes Drive caused the explosion. Fire Capt. James Brown tells Caller that three homes have incurred damages and the blast was felt blocks away, taking 34 people out of their homes. Authorities say eight people have been injured, one critically, during an explosion that leveled at least one row home and damaged others Monday morning in South Philadelphia. We're told at least four row homes were damaged and parts of three collapsed during the blast that was reported at 11:09 a.m.
SkyFox overhead showed one building appears to be completely down, another was heavily damaged, and debris was blown onto the street and alley on the even-numbered side of Daly Street's 400 block. "CNN) -- Fifteen people are unaccounted for following multiple explosions and a fire at a propane tank refilling plant in central Florida, said John Harrell, a spokesman for the Lake County Sheriff's office. Seven people were taken to regional hospitals, he said. All of the injured were workers at the Blue Rhino plant. There were no reported injuries in the surrounding areas. An evacuation area of half a mile has been extended around the plant. The nearest homes are about three-quarters of a mile away, according to Harrell."